This chapter reads Blake’s Lyca poems (‘The Little Girl Lost’ and ‘The Little Girl Found’) as political fables. 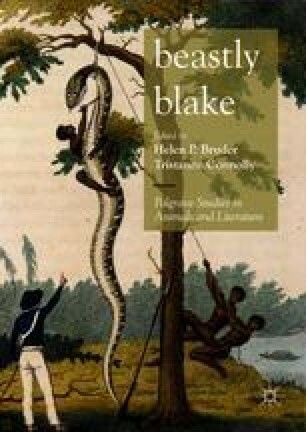 Using Derrida’s analysis of sovereign power as a performance embodied in the fable, the chapter argues that Blake’s Lyca poems embody the parasitical potential of the fable and subversively stage the performativity of violent political power. It closely reads the tension within these poems between their beastly figures: the lion and the wolf, the sovereign and the little girl. It makes the case that Lyca be considered Blake’s first strong female character. For Lyca’s act of sleeping, which is a form of ‘recessive action’ in the sense outlined by Anne-Lise François, dethrones sovereign power. Blake, William. 2017. The William Blake Archive, ed. Morris Eaves, Robert N. Essick, and Joseph Viscomi. http://www.blakearchive.org. Godwin, William. 2014. Fables Ancient and Modern. In Romantic Circles, ed. Suzanne L. Barnett and Katherine Bennett Gustafson. http://www.rc.umd.edu/editions/godwin_fables/index.html.